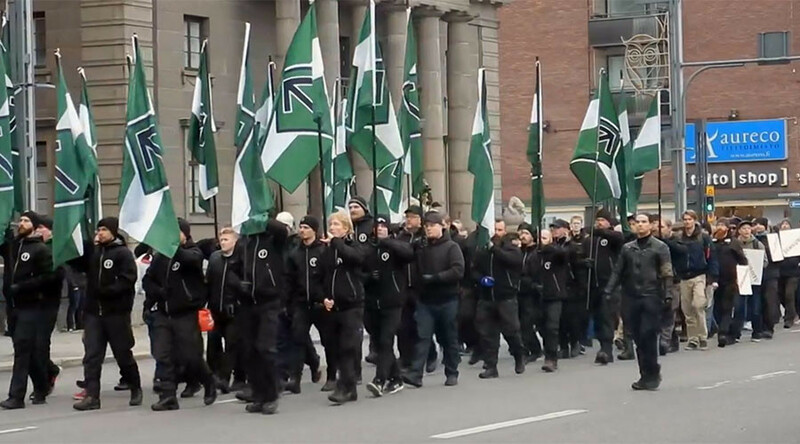 Four people were arrested in Tampere, Finland when counter-protesters faced-off against members of the neo-Nazi Nordic Resistance Movement. Members of the group gathered at Tampere Central Square on Saturday, before marching towards Pirkanmaa District Court. The group of 200 people were met by approximately 800 anti-fascist campaigners, reports YLE news. Some 200 police officers were also deployed to area for the demonstration, during which some counter-protesters threw smoke bombs. According to local police, four people were arrested at the march. Local reports say the people detained were opposing the neo-Nazi group. “Police do not accept rioting. The incident is being investigated,” Finnish police said in a short statement. Footage from Tampere Central Square shows Nord Front members carrying flags, with some supporters wearing Sons of Odin jackets. The Sons of Odin group was set up two years ago to oppose migrants entering the country. In August, police sought to have the local Nordic Resistance Movement banned by the courts, and its legal status is still under consideration. “Violent and racist groups should not enjoy the protection of Finnish society,” said Seppo Kolehmainen, the Finnish National Police Commissioner, reported Postimees.